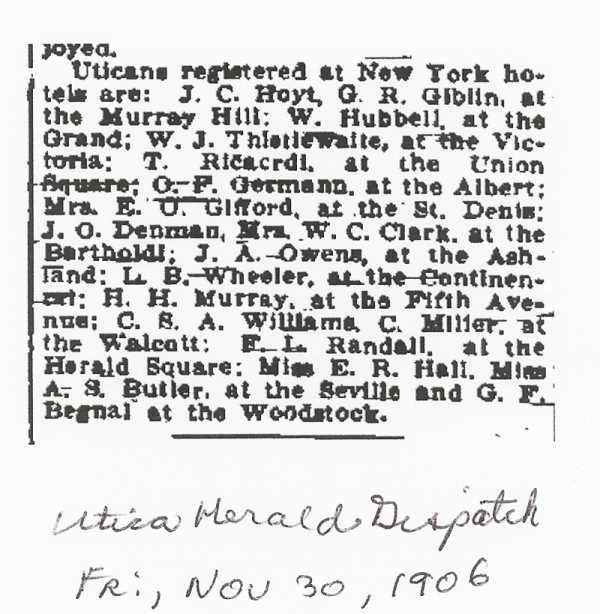 1878 " " 21 Leah St.
1879 " " 34 Hobart St.
1893-1894 " " 81 Elm St.
1895 " " 103 Kemble St.
1897-1899 " " 146 Howard Ave.
1900 - John J. Shaughnessy, Mary died 1894, living at 146 Howard St. Utica, Oneida Co., NY Children: Sarah, William, Anna L., Lizzie, Mary L., Ella. 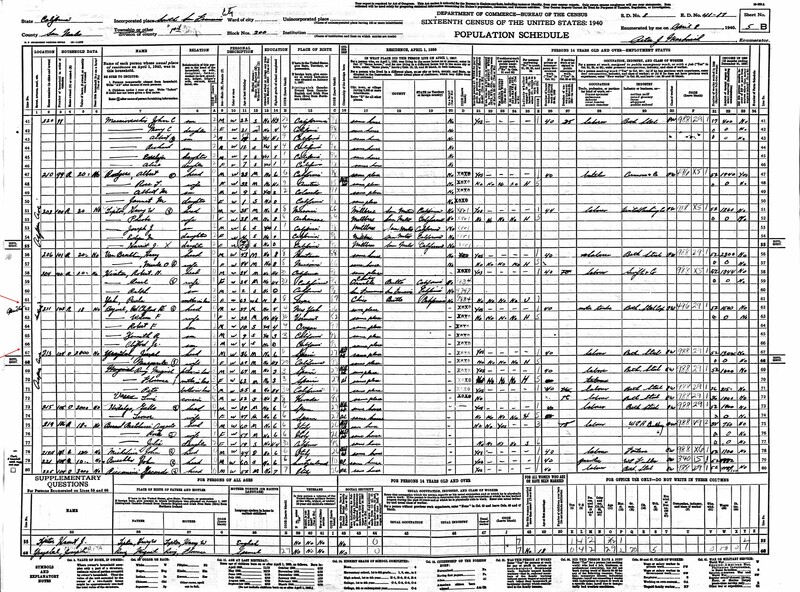 1900-1916 CA Voters Registration Index results - George (Superintendent) & Elizabeth Begnal, living in Fairfield, Solano Co. CA (line 26 & 27) no year shown. 1920 - line 63, John J. Shaughnessy, dau. Mary L., Ella/Ellen Shaughnessy Rockwell w/husband Dean M. Rockwell Jr. living at 809 Chestnut St., Utica. He is indexed as Shaunghey. 1930 - line 49, Clifford F. Begnal and Wilma Florence Gates, son Robert. Living at 320 A, 2nd Ave, San Francisco, CA. 1930 - 9 Sep - 30 Jan 1942 - Richard N. Young attends school (San Pedro) Mother as Mrs. E. Rose and father Earl Young and below the link to the records, schools and home addresses. 1931, 10 Feb - Thelma, witness to shooting - living at 848 Hamilton Ave., San Pedro. 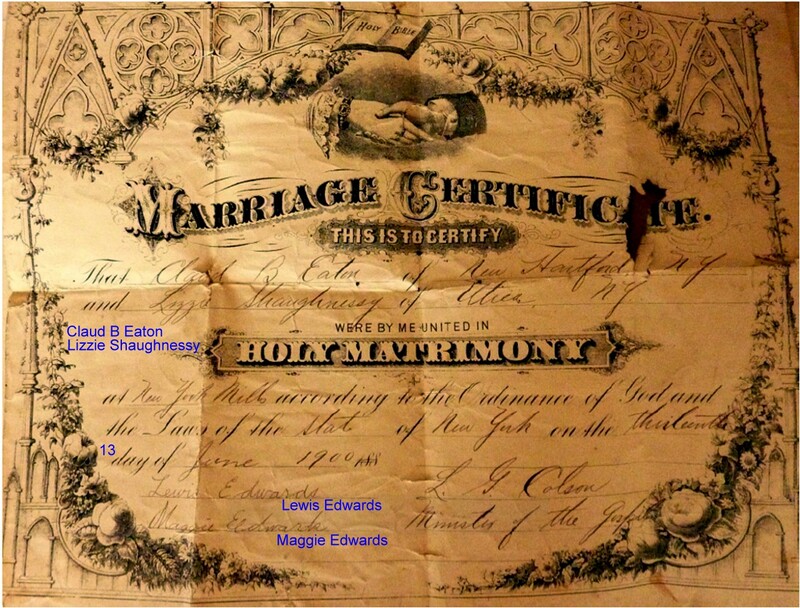 To view Elizabeth's parents and descendants of John J. Shaughnessy and Mary Louise Brewer and Shaughnessy's Utica NY. 1870-1930.